“Georgie Porgie, pudding and pie, Kissed the girls and made them cry,” goes the classic children’s nursery rhyme. And although a modern take on the rhyme may see the line, “Georgie Porgie was issued with a restraining order,” added, it’s still a firm favorite with kids everywhere. Online casino slot developer Microgaming obviously like a bit of school playground groping as they’ve included the tale in their ‘Rhyming Reels’ portfolio of games along with Jack & Jill, Hearts and Tarts and Old King Cole. This is certainly one for those of you who want to rekindle the childhood memories of singing these songs with a carton of milk and cookies. 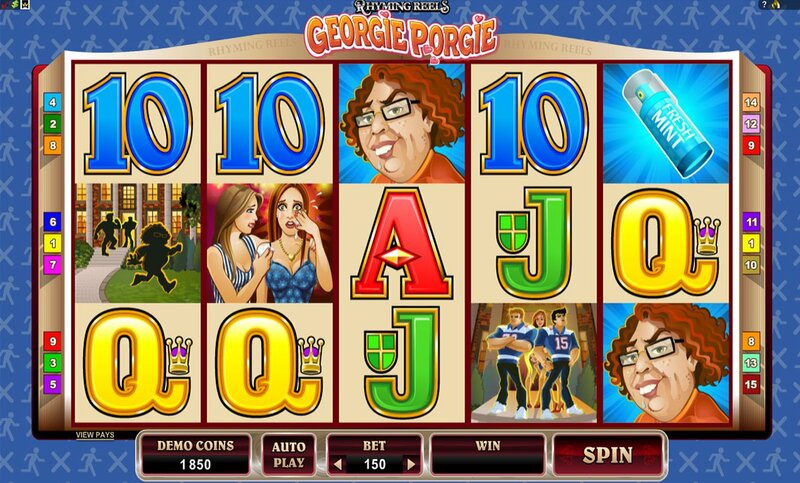 Georgie Porgie is a 5 reel, 15 pay-line slot with betting starting at a very friendly $0.01 a coin, but with a potential max. Bet of $150 deep pockets are equally catered for. The game is actually set on an American High School campus – sure to attract any North American online gaming fans – with jocks, cheerleaders and various High School images jostling for space with Georgie’s toothy geek. The Georgie Porgie logo acts Wild and substitutes for all regular symbols other than the Scatters. A 5x multiplier is added to any winning combos it helps form, but if it hits during the free spins round, a 25x multiplier is added. 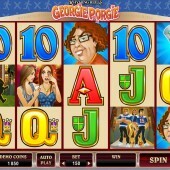 Five Georgie Wilds, meanwhile, triggers a 75,000-coin jackpot. Georgie’s pack of fresh mints is the Scatter worth looking out for. Three or more Scatters awards 15 to 25 free spins with a juicy multiplier added, as previously mentioned. Hit the Scatter again during free spins and you’ll receive an extra 2x multiplied spin. With some really good free spins bonuses up for grabs, as well as a jackpot touching $100,000 if playing at the top end of the betting, Rhyming Reels Georgie Porgie proves that when it comes to generosity, Microgaming know how to throw in the bonuses more than anyone. And if it’s put you in the mood for more nursery rhyme nuttiness, make sure you check out Microgaming’s Jack & Jill slot as we mentioned here, plus Rhyming Reels - Hearts and Tarts, a slot based on the famous nursery rhyme that carries a healthy free spins round and Expanding Wilds.